How many moles are in 22 grams of argon? How many grams are in 88.1 moles of magnesium? How many moles are in 2.3 grams of phosphorus? How many grams are in 11.9 moles of chromium? How many moles are in 9.8 grams of calcium? How many grams are in 238 moles of arsenic? How many grams are in 4.5 moles of sodium fluoride, NaF? How many moles are in 98.3 grams of aluminum hydroxide, Al(OH) 3? How many grams are in 0.02 moles of beryllium iodide, BeI 2? How many moles are in 68 grams of copper (II) hydroxide, Cu(OH) 2? How many grams are in 3.3 moles of potassium sulfide, K2S? 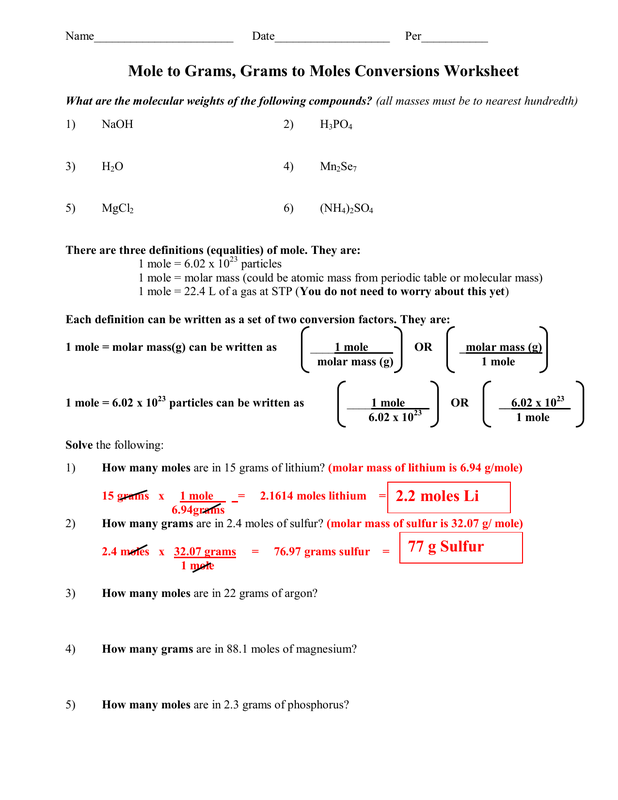 How many moles are in 1.2 x 103 grams of ammonia, NH3? How many grams are in 2.3 x 10-4 moles of calcium phosphate, Ca3(PO3)2? How many moles are in 3.4 x 10-7 grams of silicon dioxide, SiO2 ? What are the molecular weights of the following compounds?